Online music may be a treacherous space right now, but there are still a handful of music startups that may be coming close to getting it right. One of our favorites is Lala, a streaming music site that allows users to put their digital music library in the cloud, which can then be accessed from any computer. And soon, they’ll be able to access every song they own from their iPhones too, without having to worry about storage capacity or syncing. Unlike music sites like http://music.myspace.com”>MySpace Music, which largely revolve around playlists and streaming individual albums, Lala is meant to serve as a web-based music library. The site has forged unique deals with every major record label (and many indies too) that allows users to populate their online library with the music they already have on their computer (legally acquired or otherwise). Users simply install the Lala Helper app, scan their computer for music files, and sign into Lala to find their entire music library in the cloud. From there, users can browse through Lala recommendations and see what their friends are playing. The site has a unique buying model that allows users to purchase ‘web-only’ versions of songs for a mere 10 cents a pop – a price point that is very addictive, but also gives Lala a legitimate monetization scheme beyond advertising. Users can listen to these web-only songs as many times as they want, but only through the browser – if you want to load it on your iPod, you need to pay an extra 80 cents to download it. So while Lala has been fairly impressive until this point, it has still kept users chained to their desks. That may change soon, when Lala releases its iPhone application that will allow users to stream any song from their music library, whenever they want (provided they have an internet connection). While some of Apple’s traditional iPods have massive storage capacities, many people have abandoned them favor of iPhones, which offer more functionality but much less space for the money (most people have either 8GB or 16GB models). And given that these devices are also used to store applications and video files, many of us find us having to pick and choose which songs we want to carry around with us. With Lala, you don’t have to worry about that. 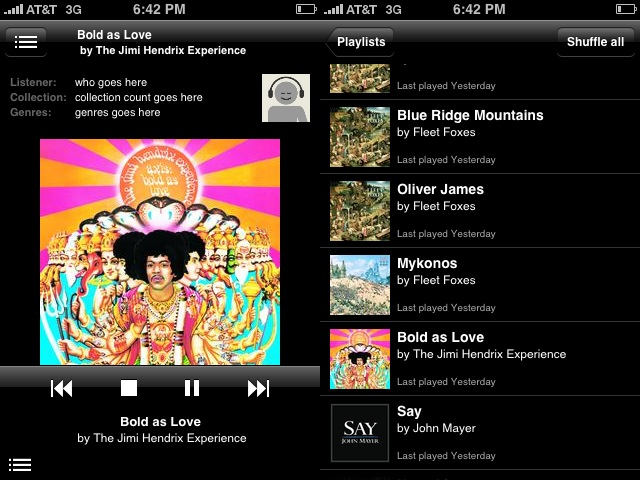 The app streams the songs from Lala’s servers, in much the same way Pandora does. But unlike Pandora and similar radio apps, you can chose any song from your music library whenever you want. Unfortunately, it still may be a while before everyone can get their hands on the app. Lala says that there isn’t any concrete release date for the iPhone application, explaining that it still needs work on a number of fronts. For one, the app still has obvious bugs (some text fields don’t update correctly, and sometimes a button won’t work). But perhaps more important, it sounds like the company may still have some legal hurdles to wrangle, and it also needs to fine tune its monetization strategy. Hopefully it won’t be too long – this app would be a boon for users with large music libraries, and would also offer a huge boost to the Lala service as a whole.